Thanks for these! Can you give the sources as well? 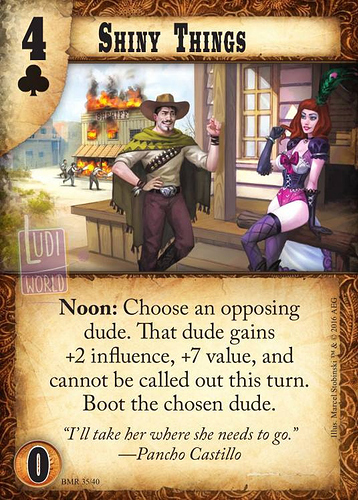 I'd like to know who out there is still reporting on Doomtown. Also, I love the Regulators home ability! I hadn't seen that one before. Warren G and Nate Dogg – Regulators, mount up! Gateway to Beyond: Solid foundation for fun new spirit decks. Competitively, can't see it besting either other home, but seems to occupy some neat middle ground and new design space. I'll give it a try for sure. Mick Aduladi: Slots great into Gateway decks in a cool way. Not great outside of that. Post-a-tron: OMG I love this little robot. So good! Even if you don't want to start him (and Gadgetorium), he slots easily into a couple good morgan builds with Q value. Cliff's #4 Saloon: Q's just got better. Now I won't have to hem and haw about the pharmacy. Good stats, good ability. What's not to like? Shiny Things: I know someone smarter than me will find a way to leverage this card. Most likely with spot removal jobs or maybe an amazing home ability (twiddles thumbs, howls triumphantly), but it is quite costly. Handing out 2 influence is no joke in this game. And shootouts are NEVER a guarantee. Also...coachwhip. Full Moon Brotherhood: Really really strong. It presents a laundry list of potentially amazing interactions. Especially with tight deck construction and in-game play. At first I was a little turned off by the fact that it does nothing definitively - except nullify jake - but it does open up so many good options, while having no downside, such that I've since been swayed. Plus, 19 GR is a thing. Morgan Regulators: Really excited about this one. MCC was my first outfit (though I've since built and played out of every home), and this is an all around cool card. The trait is just peachy, and will tangibly help against slide/fortress type decks, but the noon ability really gets my mojo goin'. No idea whether it will be better than Stables for horsey builds, but I see it opening up design space (similar to Gateway to Beyond does for EW, but better?). It feels less constrictive, like you could splash anything into it an yield decent results. Plus, 19 GR is a thing. Baijiu Jar: Really thoughtful design going on here. 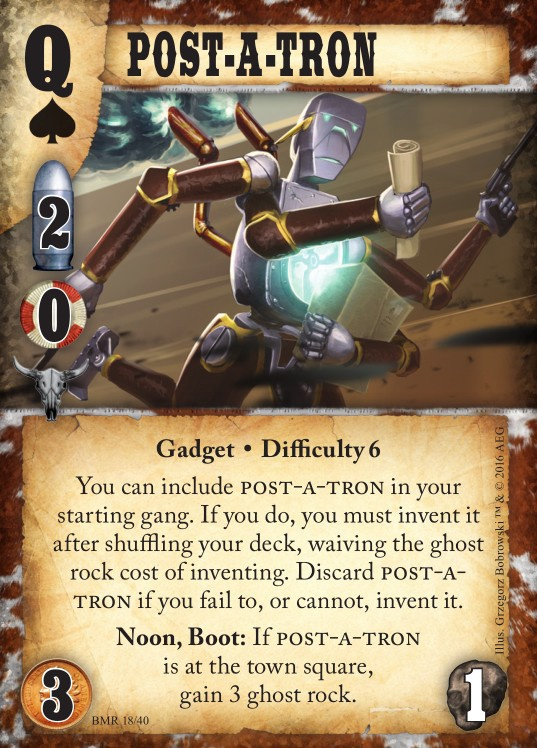 Maybe not auto include Ace, considering its trait is contingent, and its ability is shootout - but I can see it performing really well in a blockade type deck that wants to dump dudes and deeds in a crucial shootout for added clubs. After thinking a bit about shiny things, i guess its great to distract somene from joining a shootout (or, yknow, from a burning building ) or prevent them from taking your building or the town square etc. , like a paralysis mark across town, thus with a huge upside for the booted dude. Baijiu Jar looks like it'll be great for Kung Fu decks. 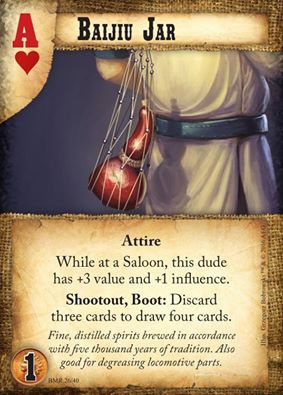 Keep a technique in hand to start a combo, chuck the rest since you can use them from discard and then get some new cards to play with. Shiny things could be a good setup for Incubation and the like. Sure, the turn you play shiny things you'll be giving them +2 influence and 7 value, but if you booted them at home, the incubation will take away 3 value, 1 influence, and 1 bullet. On future turns, only the penalty will matter at that point. 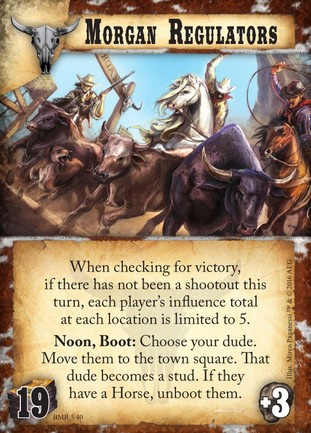 Really diggin' the Regulators art and concept. 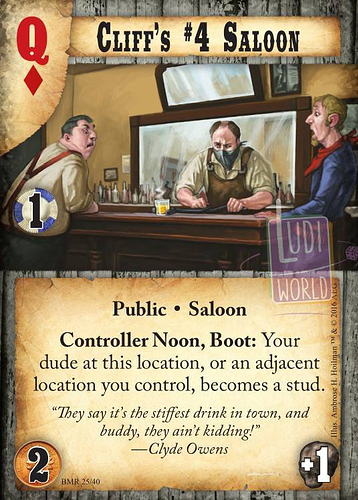 Shint things could also boot dudes at home when playing regulators and possibly not actually give them more influence that way. New Sloane home at the link below. Good accompanying article too, picking up on the in-story evolution of various Sloane homes and with some interesting mechanical thoughts on the home. I spotted some desire for a "Huckster" home for Sloane on Facebook, but I like that many of the Doomtown homes are flexible. Very specific homes can feel like a straight jacket and limit flexibility. Sloane Hucksters play well out of a variety of homes, so hopefully those who wanted a "Huckster" home can find what they were after from one of the existing four homes. Definitely! Sloane hucksters with Shadow Walk using that new home? Hell yeah! Exactly! 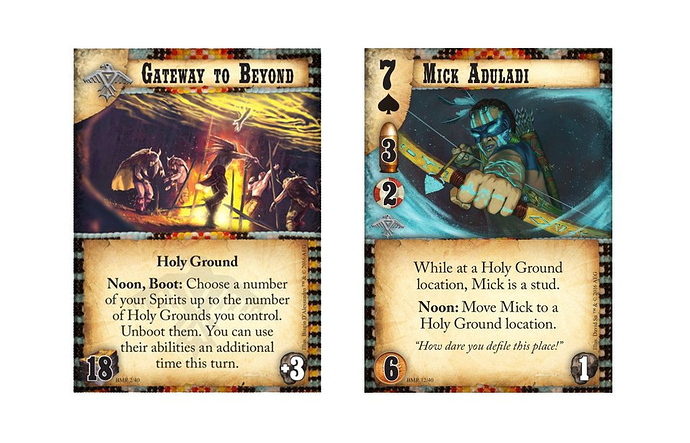 That's the kind of thing I like about flexible homes - it can interact well with existing cards to create a variety of decks instead of forcing players down a single path. Good thinking of the type of way to claim the protection racket money (and potentially CP & bounty) the bailing out via Shadow Walk. I'd like it to be a hint at Jonah Essex exp. (canon for bible, patience for waiting in the whale), but think this is a reach! Protection Racket seems unreasonably complicated and strong. I noticed someone mention on Facebook (no profile, but I lurk around the public group), that the ghost rock gains read as if they should be either/or, not both. Which makes more sense to me intuitively. But I can see how that might not be so, mechanically. Granted, the new MCC and 4th Ring homes are really strong too, so maybe it's just the general environment ramping up power - but I can see Protection Racket being a serious problem. Early pressure with the guns to back it up, income denial, and monetary reward for doing so = bad news for most opponents. Facing off against this home is going to make those early turns that much more crucial. Already I find them to be the lynchpin in any game. Slower mid-tempo decks that have difficulty defending deeds might be dead in the water. All that said, we still have lots of cards to see, and the environment is certainly diverse. Maybe some rules clarity might be forthcoming too. I like the flavor and art though, as others have said! Hm.. yeah, i was pretty sure it should read If your opponents own fewer than 3 deeds total, gain 2 ghost rock instead ? Getting potentially 4GR when the other guy gets his 2 deeds occupied sounds a bit too brutal? Or is it because you prevent him from you gaining Control points as long as there are less than 3 opponent owned deeds? Here's how I read it. You can boot a dude at a deed, including your own. 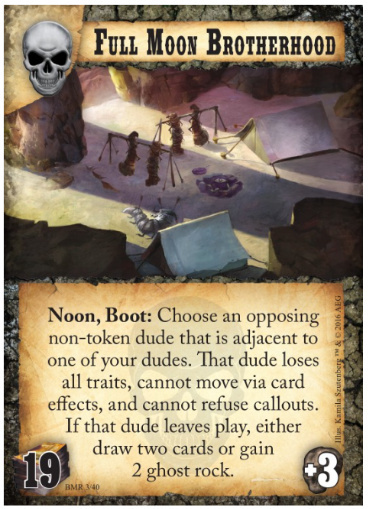 When your opponent has fewer than three deeds out, this nets you two ghost rock. If you control any of their deeds then you'll get ghost rock equal to the number you control in addition to the two ghost rock. When they have more than three deeds out then you just get ghost rock equal to the number of their deeds you control, however if you control three or more of their deeds your dude gains a bounty and a control point. It's certainly a strong home, especially against slide, and it encourages an aggressive rush play style. 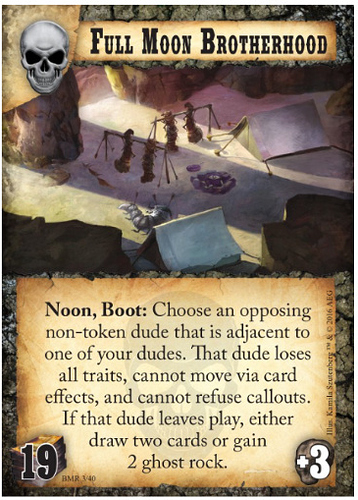 It does require a dude to boot somewhere they're vulnerable, though that dude could just be a replaceable bullet-catcher. To get the most out of it it encourages you splitting your dudes up. If the first couple of deeds out are out of town economy deeds or the Maza Gang Hideout then it can be a risk rushing in there as they're isolated from help. If the dudes are spread out to maximise the benefit of the home, then the town square won't be as well defended compared to the usual Sloane approach which could provide an opportunity for the well prepared. Time to start brushing up on the movement and positioning side of things! Definitely. The spreading out of vulnerable dudes is certainly the downside of Protection Racket, and it does encourage strategic planning for both players. Which is a plus! Not crying "broken!" yet. Just mildly concerned. We'll have to wait and see what we see. How can this home be broken with 108's in the game? Did I miss something?